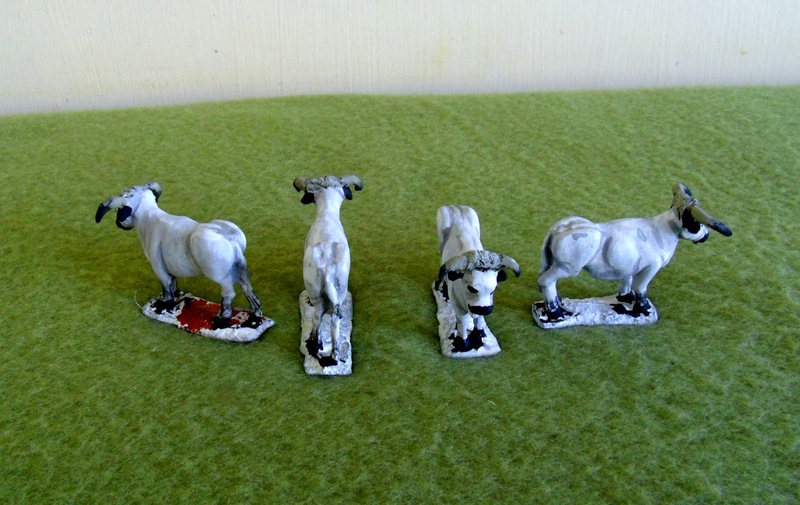 Mitch's Wargaming and Modelmaking: I got all livestock, I got all livestock! In the words of the "Rock Island Line", I got all livestock. 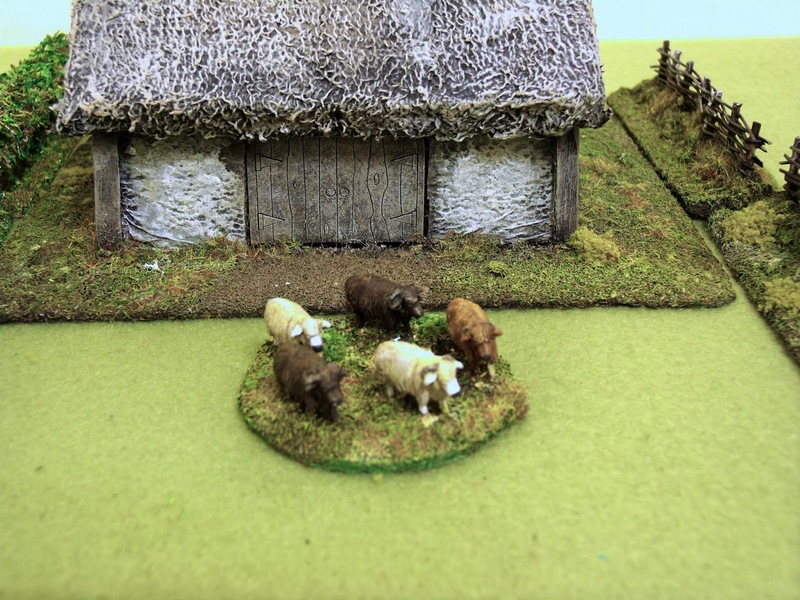 The chaps at Irregular Miniatures are good for 28mm livestock. Have a root around on their stall, it's almost always worth it. One word of advice - there's always an odd item with more than its fair share of flash, so if that's what comes out, surruptiously put it back and get another one. First up, pigs. I bought three and there really was very little to do on them. All the modelling I did was to add tusks to one (after all, you need a boar!) and prick up their ears (a few moments with the jewellers' saw and a smear of green stuff). They are (arguably) a bit fat and short-snouted for Dark Age pigs, but I'm happy. I haven't been able to find much evidence of what pre-modern pigs looked like. My guess would be they tend toward the appearance of wild boar, a bit fatter and a bit less hairy (after all if you cross a modern pig with a wild boar what you get looks very wild boar-like indeed!). So, the colour scheme is derived from the Tamworth - a very ancient and equally excellent breed! Next up, sheep. The assumption is that Dark Ages sheep are all, invariably, Soay clones. The (limited) evidence doesn't seem to totally support this. Also, sheep resembling "modern" breeds are well attested by the twelfth century, so I'm not too bothered. Easier than mowing the grass yourself! I added horns, of varying length, to four out of the five, to give the sense of a variety of ages. A single base like this is just right as a target/objective in a raiding game. The inspiration for these is Cheviot or (especially) Faeroes - the latter are known for fleeces in a variety of colours (white, grey, light red, dark red, chestnut brown, through to black). Finally, cattle. More or less everything about them is here, based on the last set I got. These will make a further (future) appearance with the four-wheel carts I'm making. Given they are going to end up permanently attached to a couple of wagons, there's no point in messing about with any sort of clever basework at this stage. Ten thousand beef and onion pies on the hoof! Very nice models. I have some Irregular Miniatures animals on my desk at the moment (I suspect that the castings are older than myself). Great stuff! I like animals on the table :-) my pigs are black and white. 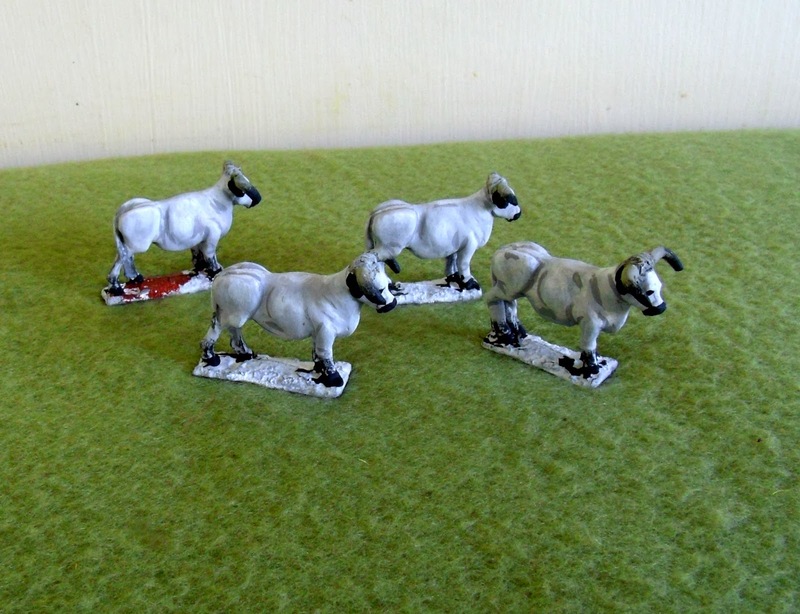 Actually i have gripping beast sheeps on the basecoat table. Nice stuff! You simply can't have enough non combatants and especially live stock on the table... and casualties but that's another story. Very very nice! Looks cool having some livestock on the table! Nicely done, love these figures! Mitch, may you tell which references did you buy? Emilio, there are some very good references online regarding White Park cattle, and the sheep reference is from a book on sheep husbandry I have at work (can't recall the title, I could find it if you want). The observations about pigs comes from personal experience with pigs and wild boar over a number of years. Funny things, pigs. Eight thousand-odd years of domestication and in one generation you're more or less back to the wild original! Sorry Mitch, I meant the Irregular Miniatures figurines you bought, the catalogue reference. I think the cattle are AN39, the sheep AN2, the pigs AN11. When you're at a show, you just root around on the stand and pick out what you want from the loose piles of miniatures. 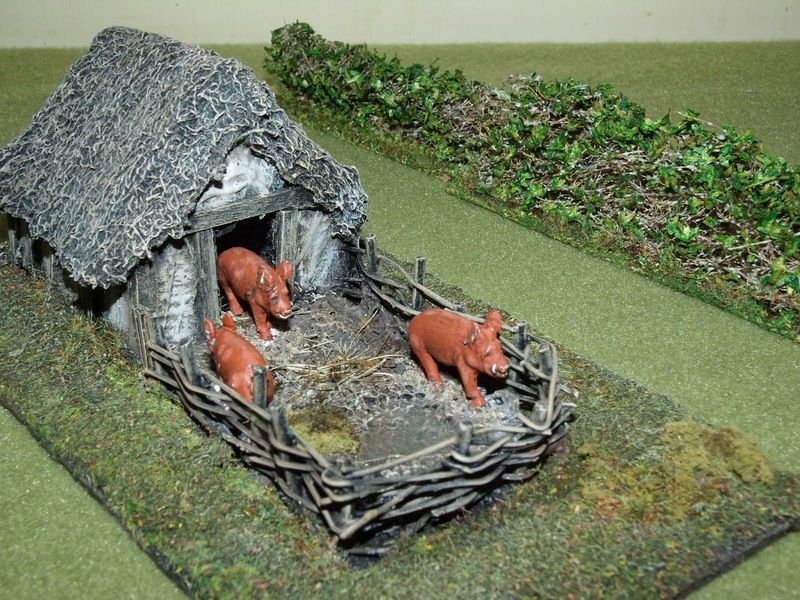 Do Donnington do 15mm animals that might suit?